I am constantly amazed with new experiences each time I hop in a research vessel as a marine biologist. I can’t help but making fun of myself when I think about how my initial research with big animals such as whales, sea turtles, and sharks (ranging in length from 1-8m) has slowly progressed to smaller and smaller organisms. I am currently working with fish larvae (1-10 mm) and juveniles (10-40 mm) that can actually be considered part of the plankton – a cool group of organisms that are many times overlooked by our society. My first fieldwork experience with larval fish happened two years ago in the Mediterranean when we were chasing oceanic fronts of different water masses to collect tuna larvae. The gear that we used at that time is pretty simple – a plankton net made with a very fine mesh (0.5 mm) towed from a boat from the surface to 30 meters depth. The advantage of this net is that we can easily target a type of organism if we know the depth where we can find it. The downside is that we totally lose a vertical perspective of how the plankton is distributed in the water column because all organisms are collected in one single net independently where they were caught. Here is where the MOCNESS net introduces a totally new dimension to our study. I had seen the MOCNESS-1 before—a monstrous gear with 9 nets attached to a 3-meters tall frame that can easily crush an operator during the deployment with the swing of an unexpected wave. Tiny little plankton that fall inside the 1 m2 mouth of the MOCNESS-1 are accumulated in the cod end (i.e. plastic bucket) of the net, where the scientists can easily collect them for further analysis. 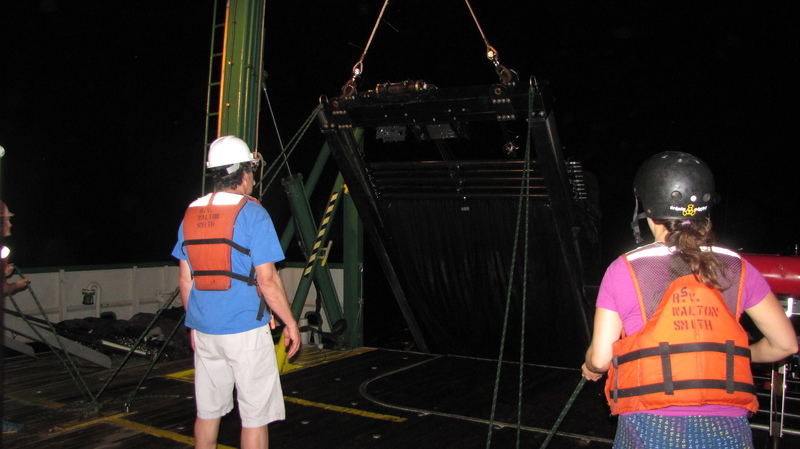 The great advantage of the MOCNESS is each net can be used to capture plankton in one specific depth, allowing scientist to determine at what exact depth was each organisms collected. In this cruise, we are using both MOCNES-1 to capture relative small plankton and MOCNESS-4, a version four times bigger than the MOCNESS-1 and has a wider net mesh (1 mm), allowing it to filter more water and capture larger amounts of larger-size plankton such as fish larvae. The reason we are using these two different gear types is that our goal is to compare the three-dimensional distribution of the fish larvae captured with the MOCNESS-4 with the distribution of the smaller planktonic prey captured with the MOCNES-1 and describe how fishes aggregate in relation to their food resources. It has been three days since we started towing the MOCNESS nets back and forwards across the edge of an eddy. We want to better understand how can eddies affect the distribution of fish larvae and their food. I can’t wait to see the results from these observations and what new insights will they contribute to oceanographic research.